There was a slide I considered in my Exploring AJAX presentation that was a little tangential, but I left it in as a little extra positivity for APEX. I think this concept was explored in some facet during my 2015 Kscope visit, possibly even in a Marc Sewtz talk. Forms has a ceiling. APEX has room to grow. 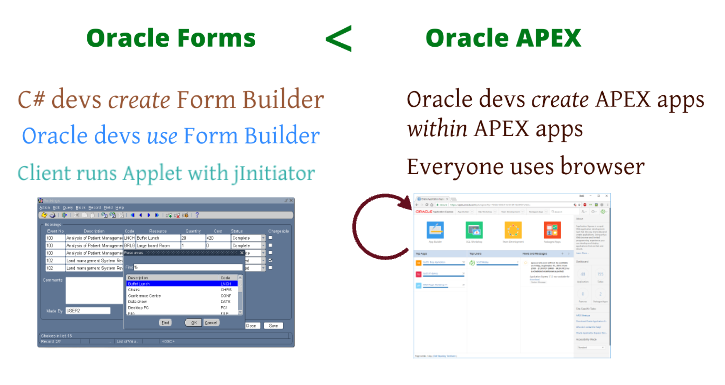 Oracle Forms, as wonderful as it is/was, was never used by the people who built it. Ever built a back-end application you use youself? You get rid of all the little annoying things, don't you? Now think about the packaged applications. They grow, extend, take advantage of new features. The APEX team need build these applications using the product they're developing. Heck, even APEX is built using APEX. At some point long ago, there was a chicken and egg conundrum, solved with mod_plsql. ie, hand-write PL/SQL to generate a cute UI, that you can then use to build your meta-data with, and future pages rendered from the data. Again, I think Marc described this piece of history far more elegantly with Juergen on The Oracle APEX Talk Show (apex.press), which I'm far behind on. Science podcasts are too irresistable. Just recently, Scott (of the Spendolini variety) noted the top 4 collection of technologies in the (skewed) 2018 StackOverFlow survey are exactly what makes Oracle APEX tick. So now, the APEX team build APEX applications for APEX developers to build APEX applications, using core internet technologies. There is a feedback loop here that can only be good for the future of the product. And all this happens within the browser. Driven from data in the database. That's winning, across a short, yet effective hardware stack. I wonder if other contemporary IDEs are similar?